When you first decide to try painting, the choice of art supplies available can be overwhelming and confusing. So here's an art supplies list of everything you need to start painting with acrylics. You don't need black to darken colors or for shadows as mixtures of the other colors will give dark colors. I personally like cadmium red medium and cadmium yellow, but you must be careful not to get the paint on your skin as cadmium pigments are poisonous. Again, you don't need handfuls of brushes in different sizes and shapes. With time you'll develop a preference for a size of brush and shape, as well as type of hair. To start, we recommend two different sized filbert brushes, with stiff hairs. A filbert is a versatile brush shape that gives a range of brush strokes depending on how you're holding it, from narrow to wide. A lot of my paintings are done with just one filbert. If you use a palette knife rather than brush to mix paint colors together on your palette, you don't end up wasting the paint that stays stuck in the brush. It's also easier to mix colors together well. A palette knife can also be used to scrape paint off a canvas when things go wrong (if the paint hasn't dried yet). It's convenient to have a bit of each paint color squeezed out of the tube onto a palette, ready to be picked up with a brush. 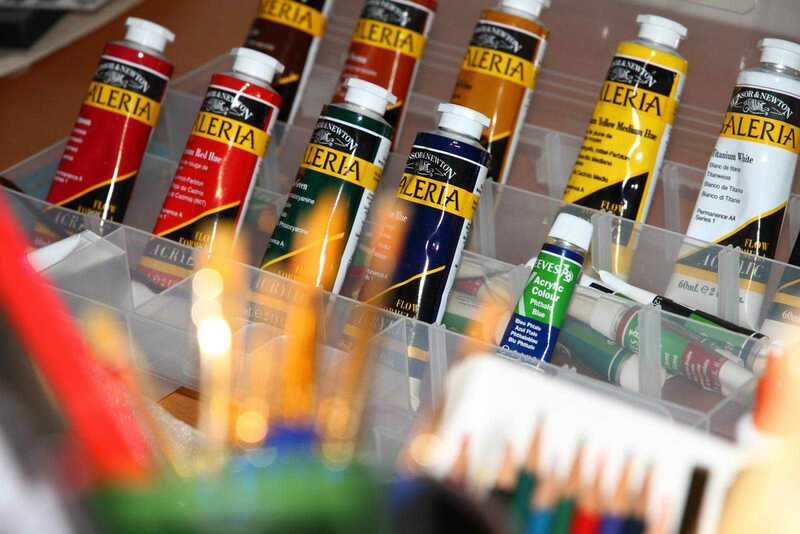 Because acrylic paints dry fast, you need a moisture-retaining palette not a traditional wooden one. If you squeeze paint out on an ordinary palette, a lot of it will dry before you've used it. You're not going to paint a masterpiece every time you pick up your brush. Sometimes you need to play and practice. If you do this on paper rather than a canvas it's not only cheaper but storage is less of a problem too. You may like using a large, wire-bound sketchbook, but another option to consider is a pad of canvas-texture paper. Buying canvas that's already stretched and primed gives you more time for painting. Buy a few different sizes and shapes. Long and thin are great for landscapes. You need a container for water for both rinsing your brush clean and for thinning the paint. An empty jam jar will do the trick, though you may prefer a plastic container that won't break if you drop it. You can buy all sorts of containers, including ones with holes along the edges for storing brushes that are drying. You'll need something for wiping excess paint off a brush, and for getting most of the paint out before you wash it. I use a roll of paper towel, but an old shirt or sheet torn into rags also works. Avoid anything that's got moisturizer or cleanser in it as you don't want to be adding anything to your paint. Once dried acrylic paint doesn't like to wash out of clothes, so wear a heavy-duty apron to protect your clothes. Easels come in various designs but my favorite is a floor-standing, h-frame easel because it's very sturdy. If space is limited, consider table-top version. When painting on paper, you'll need a rigid drawing board or panel to put behind the sheet of paper. Pick one that's larger than you think you might need, as it's very annoying suddenly discovering it's too small. Sturdy bulldog clips (or large binder clips) are the easiest way to keep a piece of paper on a board. I generally use two at the top and one on the sides (sometimes only one side, if the piece of paper is small). When you've finished a painting you're particularly pleased with, give it another level of protection by varnishing it. A varnishing brush has soft hairs, helping you to apply varnish thinly and evenly. It makes the job much easier! A pair of fingerless gloves helps keep your hands warm while still leaving your fingertips free to get a good grip on a brush or pencil. Use a pair in a rather distinctive green (it does make them easy to spot!) from Creative Comforts. They're made from a stretchy cotton/lycra mix for a snug fit, so you'll find they don't obstruct movement or get in the way.